Hi: I’ve never heard of this oven. Sounds great. Can you use a carbon steel plate or do you have to use a pizza stone? Do you live in the US or another country? May have to get one of these. Thanks for the info. Hi Mark, I’m in the USA and ordered mine from Cabella’s near the holidays. It comes with a stone and I’ve never used a steel plate in it. 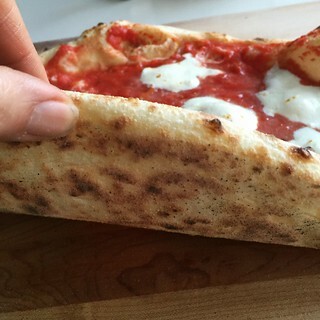 Frankly, i highly prefer it for Neopolitan style pizza using 00 flour (Caputo) but I’ve been using it for NY dough too because it saves so much time! Looks great! Did you take any pics of the bottom of any of those pies? I was curious to see how they come out in the Blackstone Oven. Thanks. Question…we love our pizza oven but the bottom of the pizza is not getting as brown as we would like. Seems under cooked compared to the top. Your tip is to put the flame regulating dial in the 4 o’clock position to get the ideal temperature. When you do this, what is the temperature on the gauge? I read that it should be between 350 – 375. Hi Lisa – I don’t pay much attention to the temperature gauge because I have an IR thermometer that tests the stone temp. I’m looking for anything north of 700 or 800 degrees, which I easily get. I’m wondering if maybe you keep your oven outside and perhaps the cold winter causes it to need a bit more time to heat up? I think my first step would be to test the stone temp of possible. Make sure you have the gas regulator turned all the way up. no fooling. I am not a pizza dough expert nor am I a wood fired oven expert but i do make a good dough (overnight refrigeration) and have a blackstone, bake at about 700 F on stone measured by the infrared thermometer. It cooks in about 90 to 120 seconds. depends on how much browning you like on your crust. wife not liking too much, me liking a bit more. I have practiced and then invited friends (couples) over for a pizza party. As a result I have helpd sell 4 more blackstones, and i don’t work for them. i have used it to bake bread 2 times, will try more times, have roasted beef in it 2 times. baking and roasting take a little thought so now that you out there know it can be done give it some thought and try it. i don’t want a pricey wood fired oven and i don’t have any wood so the blackstone makes me feel important about making pizza. We have had are for 3 yrs and love it. If you aren’t comfortable putting pizza right on stone just use those cheap tinfoil pizza pans. Also try cooking a steak in your pizza oven in a tinfoil pan. Comes out very tender and juicy. I haven’t tried anything other than pizza yet but I absolutely LOVE this pizza oven!! The Blackstone works, first time if you know how to make a good dough. I have set the stone at 550 to 650 or slightly higher seems to work well. I use Ir temp to check the crust temp at about 400F it browns. Takes maybe 2 minutes. Did baguettes 4, loaded on parchment paper from peel. not good idea paper leaves some off flavor at those high temps. baked nicely but I use wet dough and sprayed oven with a hnd sprayer for moisture during first 5 minutes. I set stone at 450F, then turned off heat, when temp of stone dropped 15 degrees I turned heat back on. Did this 3 times during 15 minute bake. Nothing spectacular and somewhat more involved than baking in my home gas oven. Asked Blackstone to ofer a “temp” controller version so Blackstone works like an inside oven. Maybe not worth the effort. But it makes me want to keep trying. Interesting! I thought about trying to do bread in there – glad to hear your feedback. I do love my Blackstone. In fact, in summer, I plan to solely bake Naples style pizzas (although I love the NY crust too) -keeps the kitchen cool! OMG. Seriously jealous!!! Santa was very good to you! Your pizza looks amazing.